The intimacy of songwriting is a difficult skill to master for the best of musicians. When they do you find yourself pausing, experiencing a physical reaction to the music as it halts your progress and you allow it to wash over you, taking hold of your emotions and ushering them inside the songs. This magical power of music was something I experienced when I sat down to listen to Mark Moldre’s debut solo album The Waiting Room. Moldre isn’t doing anything revolutionary in terms of structure, content or mood but he does excel in those areas in almost every one of the album’s eleven songs. He is trading at the junction of americana, indie and guitar pop where songs never settle into one genre but instead swing and float between them. The opening track The Buzzing Of Bees is pure Mark Linkous folk and experimentation filtered through Wilco’s fantastical soundscapes. It sets up the mood of the record beautifully and signals that it isn’t going to be a one dimensional singer-songwriter show. As quickly as he sets the first scene Moldre lifts the layers to reveal the single In This Life with its optimistic bounce that feels like late afternoon autumn sun, warding off the coming cold. Melancholy seeps through the song’s upbeat rhythm and posits itself as a clear theme to The Waiting Room. With good comes bad, with bad comes good but life keeps on going. Moldre possesses a keening, almost straining grain of a voice and on Troubled Genius it is almost pushed to breaking, though interestingly he isn’t singing loudly. It adds that lived-in feeling to his songs, much in the way that Mark Everett of Eels or Tom Waits colour their songs with a select palette of vocal characteristics. Combined with clever and understated pacing of his words there is a sense that much time and effort has gone into the lyrical arrangements throughout the album. The spectre of americana hovers above the music in two forms. Again it is the vocals that use that world weary tone and mood that singers like Wild Oldham and Phosphorescent employ but instrumentally Moldre adds restrained touches of piano, Wurlitzer, harmonica, mellotron and slide guitar that all combine to give the songs a real and organic flavour. They sound lived in, loved and pre-worn. Things aren’t all doom and gloom and Moldre shows how melancholy can be uplifting if crafted the right way. On Ferris Wheel he swerves and turns corners like a woolly Sonic Youth colliding with a power pop group and it is gleefully infectious stuff. Fans of Australian indie will recognise the influence of Jamie Hutchings (a long time friend of Moldre) onLifeboat with its soothingly deconstructive bent and a lilting melody and backing choir. It is a gorgeous paean to life as a journey rather than a destination, laid bare with a confidence that enables the space and silence between the notes to breathe volumes. The ghost of Wilco hovers over the final track Smoke, both in Moldre’s imaginative lyrics (smoke starts to rise over skyscraper skies) and the use of percussive noise and texture to disrupt the central elegance of the song. This is no amateur aping of influences though, Moldre invests it with more than enough of his own creativity and personality for it to be his own distinct composition. Too often musicians who emerge from the ashes of fallen bands and take the solo route become too self obsessed and caught up in their own myth. Moldre has stepped back from that by writing a very personal album that doesn’t exclude the listener. There are sepia-tinged universal themes at work in The Waiting Room that conjure up feelings of nostalgia, loss, love and optimism and Moldre has captured the mood of the human soul with great artistic clarity. 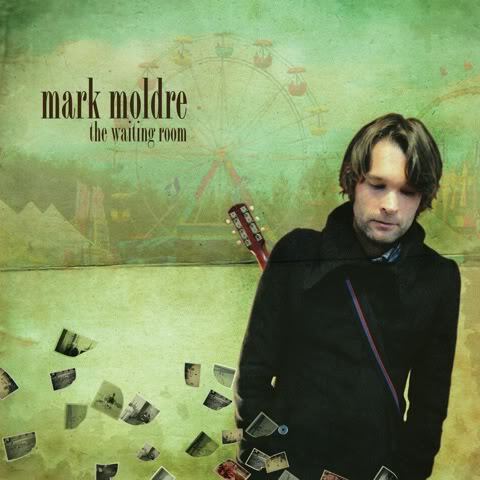 Tags: Album, Americana, Mark Moldre, Review, The Waiting Room. Bookmark the permalink.